2 Who can drive state vehicles? 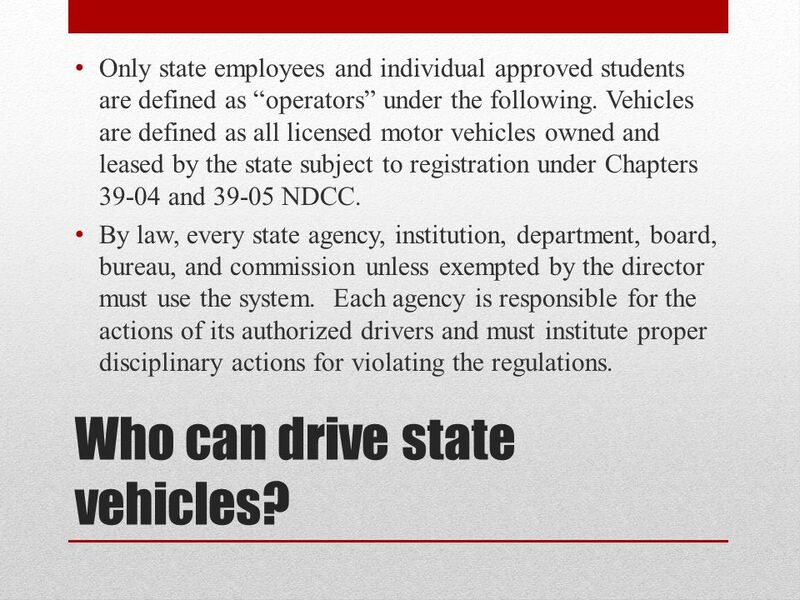 Only state employees and individual approved students are defined as “operators” under the following. Vehicles are defined as all licensed motor vehicles owned and leased by the state subject to registration under Chapters 39-04 and 39-05 NDCC. By law, every state agency, institution, department, board, bureau, and commission unless exempted by the director must use the system. Each agency is responsible for the actions of its authorized drivers and must institute proper disciplinary actions for violating the regulations. 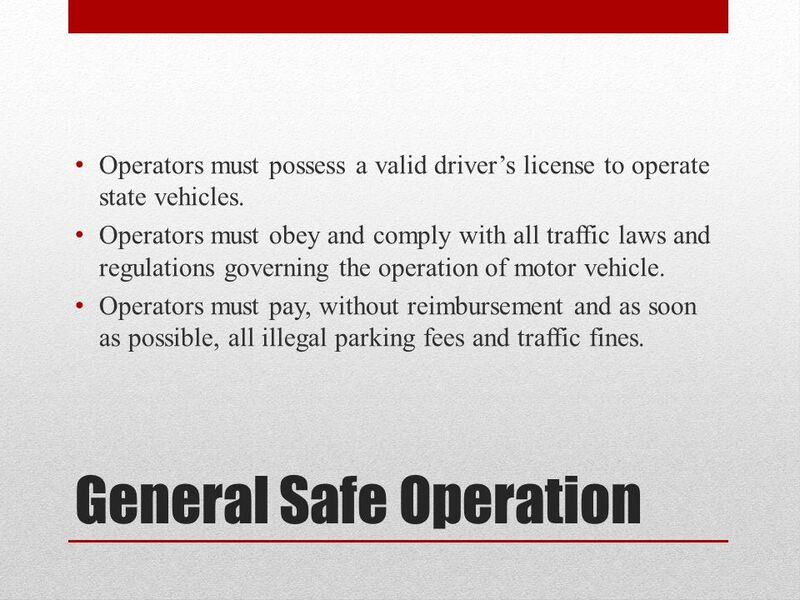 3 General Safe Operation Operators must possess a valid driver’s license to operate state vehicles. Operators must obey and comply with all traffic laws and regulations governing the operation of motor vehicle. Operators must pay, without reimbursement and as soon as possible, all illegal parking fees and traffic fines. 4 General Safe Operation Operators must use state vehicles only for conducting state business and not for personal use. 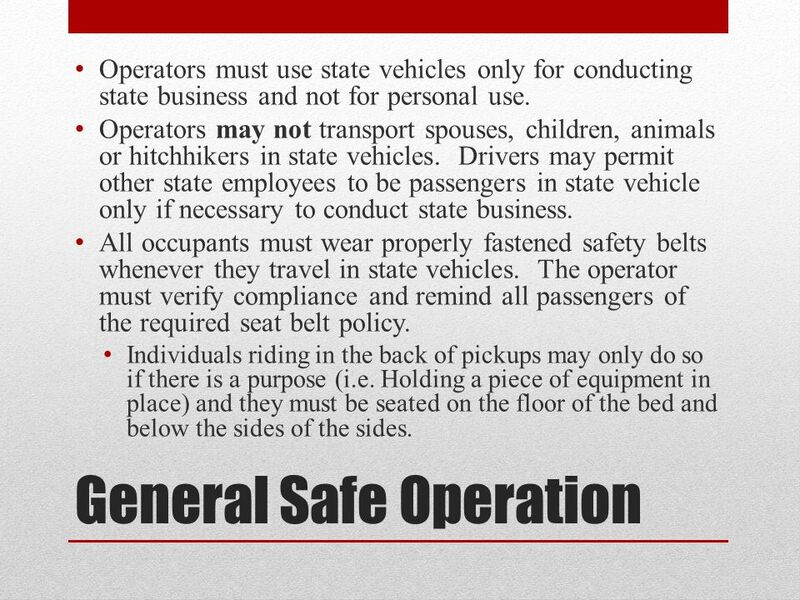 Operators may not transport spouses, children, animals or hitchhikers in state vehicles. Drivers may permit other state employees to be passengers in state vehicle only if necessary to conduct state business. All occupants must wear properly fastened safety belts whenever they travel in state vehicles. The operator must verify compliance and remind all passengers of the required seat belt policy. Individuals riding in the back of pickups may only do so if there is a purpose (i.e. Holding a piece of equipment in place) and they must be seated on the floor of the bed and below the sides of the sides. 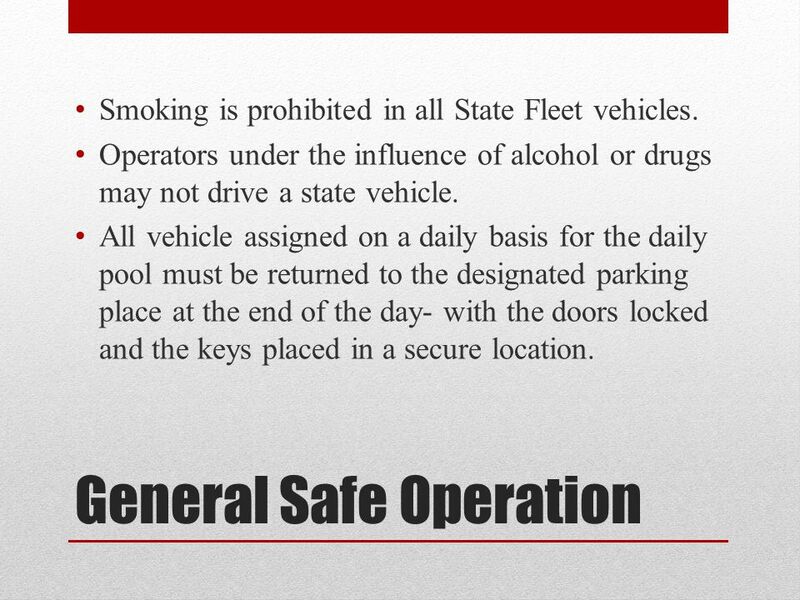 5 General Safe Operation Smoking is prohibited in all State Fleet vehicles. Operators under the influence of alcohol or drugs may not drive a state vehicle. All vehicle assigned on a daily basis for the daily pool must be returned to the designated parking place at the end of the day- with the doors locked and the keys placed in a secure location. 7 Other Information North Dakota State Fleet Services Policy Manual This manual is prepared by the ND Department of Transportation and contains more detailed information regarding the state fleet motor vehicle regulations. It is the standard for VCSU’s Motor vehicle Safety safe operating procedure. The information provided are the minimum requirements required of all state employees/operators. 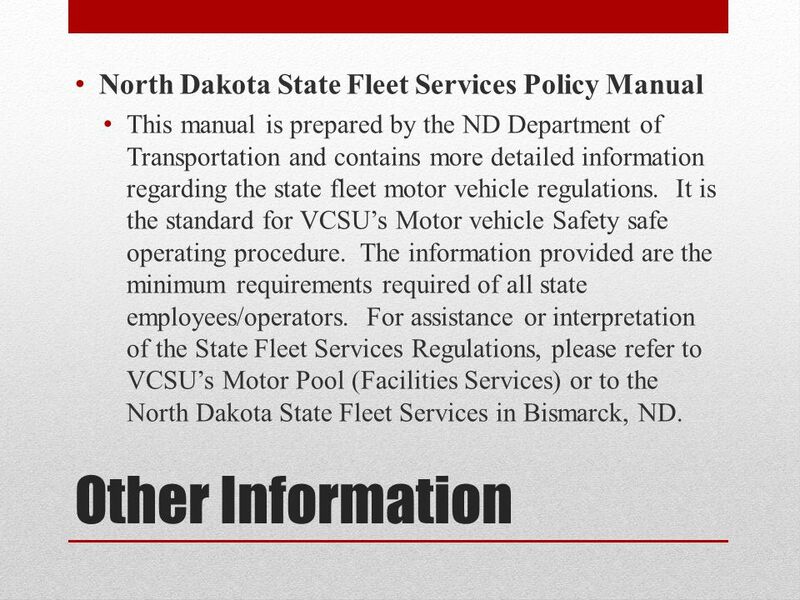 For assistance or interpretation of the State Fleet Services Regulations, please refer to VCSU’s Motor Pool (Facilities Services) or to the North Dakota State Fleet Services in Bismarck, ND. 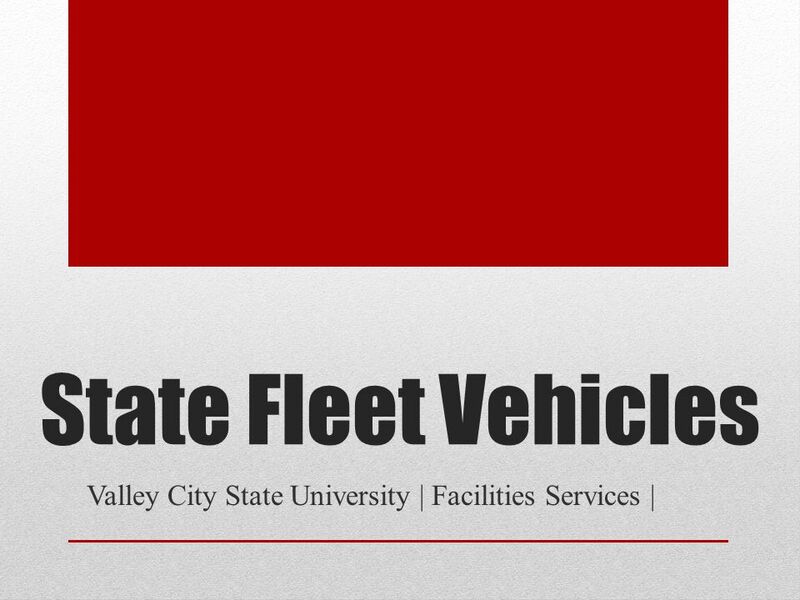 Download ppt "State Fleet Vehicles Valley City State University | Facilities Services |"
Use of FuelTrac Card for Purchases of Gas for University Vehicles FuelTrac can ONLY be used in State owned Vehicles or those leased through the State Enterprise. OPERATION SAFE STOP An Educational Campaign by the New York Association for Pupil Transportation Prepared by NYAPT through the National Highway Transportation. 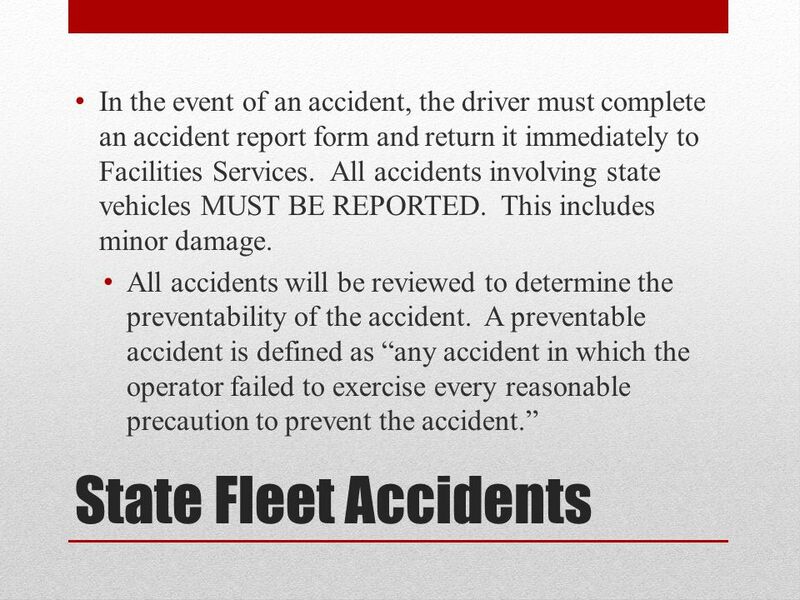 Policies and procedures for reserving and using state fleet vehicles for VCSU faculty, staff, and students. State Fleet/Motor Pool Training 09/13. Chapter 1-3 Test Review Driver’s Education. List the 5 restrictions you must follow while on you special learners permit. Unit 1 Rules of the Road.  When applying for a driver’s license, you may be required to take vision, written, and driving exams.  You are allowed 3. ROCHESTER INSTITUTE OF TECHNOLOGY Golf Cart Training. Module 9 Leaving the Office. Objectives  Recognize forms and equipment carried on the route  Properly process hot case mail  Apply automated mail procedures. OU Fleet Service & OU Motor Pool Theta M. Dempsey Transportation Operation Center 510 East Chesapeake, Norman Oklahoma. Driver Safety Program.  Address Safety  Achieve Accountability  Meet ORM and LPAA Requirements. Motorized Off-Road Vehicle Training University of Notre Dame. CONTROLLED SUBSTANCES AND ALCOHOL USE TESTING REGULATIONS FOR DRIVERS.